Instant fuel for your most demanding rides. Each Honey Stinger Energy Gel features pure honey from the USA with water, sodium, potassium, B complex vitamins and all-natural flavors for lasting energy and speedy hydration. Strawberry and Ginsting flavors contain kola nut extract which is a natural source of caffeine. They're easy to consume on the bike and taste great in your tea or on your toast! 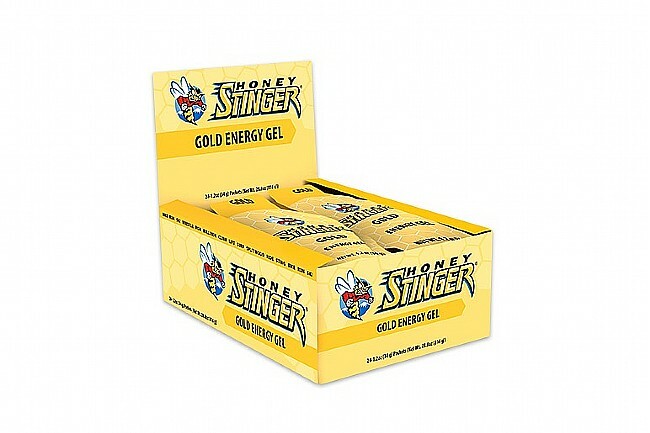 Honey Stinger Classic Energy Gels are sold in boxes of 24 packets. Flavors: Gold (natural honey) or Ginsting. I take it in my cycling jersey, on the road as well as to spin classes, where it is easily swallowed without much effort. I really like Honey stinger products, they always taste good, pack well, and never upset my stomach.